for new dining experiences in local schools. In spring 2013, the San Francisco Unified School District (S.F.U.S.D.) began a five-month collaboration with the design firm IDEO to re-imagine the school food system. This effort might not sound unique. Childhood obesity has become a hot topic, in large part thanks to the first lady’s Let’s Move! campaign and projects by high-profile chefs like Jamie Oliver and Alice Waters have aimed at getting fresh, healthy foods in schools. And yet that’s just what most school districts do. The S.F.U.S.D., to its credit, has made great strides in the quality of food available to students in the last decade, most recently engaging Revolution Foods, a company dedicated to creating healthy meals for schools, as its primary food vendor; but, until now, they hadn’t put as much effort into considering what the 40 short minutes that students actually have for lunch are like. IDEO, known for putting people’s experiences, not objects, at the center of the design process (what they call “human-centered design”) insisted that this be the starting point. On July 11, 2013, at Everett Middle School, a diverse crew of high school students sit around low round tables in a cafeteria and look at a picture of Maru, the Japanese cat that became a YouTube sensation for jumping in and out of boxes, illuminated on a screen. “Maru is the best prototyper ever. Fearless. Fun. Today we want you to channel your inner Maru,” instructs Coe Leta Stafford, the design director and project leader from IDEO. The teenagers have come to participate in a prototyping session, which will help determine what it is that high school kids really care about when it comes to lunchtime. Joyce Gu, a senior at Thurgood Marshall High School, lets out a giggle. She’s wearing skinny jeans and Converse All-Stars, scrolling through her Instagram feed on her cellphone. She’s known for posting pictures of unusual foods that she’s tried (the most recent was Chinese abalone). Joyce is one of the 56,000 students in the district, 61 percent of whom qualify for free or reduced lunch (a family of four that makes $40,000 or less a year qualifies). Despite the district’s location in San Francisco, which is 43 percent white, only 12 percent of the public school students are white (24 percent are Latino, 42 percent are Asian, and 10 percent are African-American.) Many white students end up at one of the many prestigious private schools in the city. Joyce and 14 other students spend the next hour participating in simulations of their lunch hour. They are given an allowance ($5 for the whole week and various options for how they might pick up their food each day, including the traditional lunch line (not a big hit), a vending machine (though the food appears to be fresh, students are skeptical), and a mobile cart featuring meals from a local restaurant (everyone’s favorite). Afterward the students are asked to reflect: What did you choose and why? What works best for you? How did you choose? The answers are wide-ranging and sometimes surprising. Some students delay gratification — choosing to bring a lunch from home until Friday, when they will reward themselves by spending all $5 at once. Some talk about prioritizing sharing food with their friends who don’t have any — a dent in their budget, but a boon for their social lives. Still others focus on figuring out which meal they can get the fastest (they have homework to do) that will also give them the most energy for sports practices later in the day. Almost universally, they say that lunchtime is about spending time with friends — first and foremost — not food. The IDEO team documents their answers painstakingly. Then Stafford asks the students to check out an app on the cellphone stationed at each table. It’s a prototype of what IDEO calls “smart meal technology”— where kids can pre-order meals in the morning that they will eat later in the day. They can also provide feedback on the meals and set dietary preferences; student nutrition services, for their part, can collect data on kids’ preferences and eliminate food waste. The kids intuitively start tapping away. The collaboration, aimed to change that perception, was paid for by the Sara and Evan Williams Foundation, which essentially bought the S.F.U.S.D. time (multiple staff members, like O’Keefe, were pulled off their day-to-day grind to participate), and of course, IDEO’s expertise. The S.F.U.S.D. — like most school districts — would have traditionally approached a challenge like this by doing an assessment of its current labor, vendors, equipment, budget etc., and then writing a lengthy report of recommendations for improvement. Places like Oakland High School, right across the bay, have recently taken to closing school campuses during lunch in order to force kids to eat the healthy meals provided. Over 1,300 students, parents, nutrition staff members, principals, teachers, administrators and community partners were involved in the process, which included workshops, prototypes and experiential exhibits — all trademark IDEO tools. The IDEO and S.F.U.S.D. 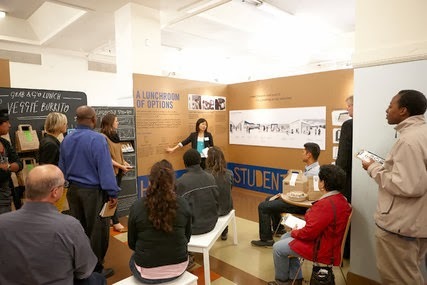 teams, consisting of almost a dozen people, then worked together to consolidate the learning and come up with 10 design recommendations and a comprehensive plan for how they might be prioritized, paid for and realized in schools. The whole team presented its proposal at the Board of Education meeting on September 17 to an unusually full house, starting — not surprisingly — with student voices and also including testimony from nutrition staff workers, the other population for whom the design of the food experience in schools is most urgent. They proposed three very distinct eating experiences aligning with the developmental stages in a student’s life, but most fundamentally based on what the students themselves expressed wanting. For elementary school, they imagine lunchrooms where kids sit together at round tables and eat family style — learning to serve one another in stages (healthiest foods are brought out first by nutrition staff workers who oversee their own carts). He requested that the pilot program take place at his school, where a large majority of the 700 students are Asian immigrants. “Their exposure to American culture is coming through the food that the dining services provides,” Principal Chew explained. The cart concept would work well, he believed, because it would be reminiscent of familiar styles of eating, like dim sum, but feature new foods. For middle school, the focus shifts toward more independence; students can choose “grab-n-go lunches” from mobile carts and then sit in spaces designed by them. And in high school, it’s all about choice; students multitasking on their short lunch break leverage the convenience of new technology, like the app tested out in the simulation, and are rewarded with discounts for making healthy choices and eating at school more frequently. They spend less time waiting in lines and more time hanging with friends. But the other commissioners, seven in all, seemed on a much faster track: “Put me to work. I’m really excited about this. I want to see us move forward,” said Hydra Mendoza.